Amazon has a large beach blanket! This beach blanket is heavy duty and compact. It comes in a family size of 70″ x 55″ which is big enough for an entire family. It comes with a handy pouch (6 inches X 7 inches) to hold the blanket firmly making it easy to carry. 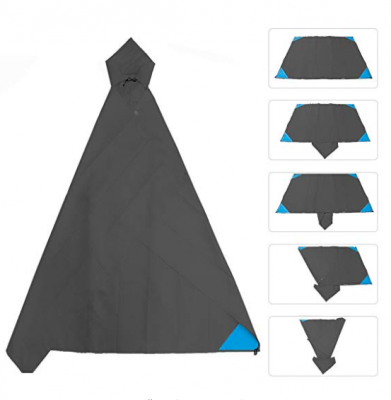 It’s Made of durable, lightweight and breathable 100% PARACHUTE nylon. This blanket will dry quickly and withstand many years of use. Sand won’t stick to your blanket. Just shake it off after using on the beach. You can anchor the beach blanket with the six sand pockets. They are meant to be filled with sand to position the blanket firmly for a beach day in windy weather. You can also use the four stakes as the supporting accessory by pushing them down deep. This is a multifunctional beach blanket. You can use it as a picnic blanket, for relaxing during vacation, camping, hiking, or simply for hanging out with friends or family in a garden or backyard. It looks like you missed the promo code for this deal. I’ll add a new promo code when I get a new one. You should check out my current list of Amazon Promo Code Deals. The current price is $9.95. Step 1: Click this large beach blanket link.